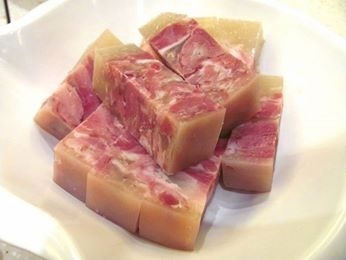 歐美也有一種類似的冷盤叫 head cheese 或 brawn，head cheese 名字中有個 cheese，但與起司毫無關係，是豬/牛頭肉熬製的肉凍 (aspic) ，豬/牛頭皮骨富含膠原蛋白 (gelatin)，因此熬煮冷藏後呈現果凍般質地。維基百科有以下的介紹：Head cheese or brawn is a cold cut that originated in Europe. 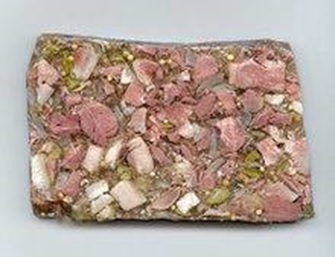 Head cheese is not a dairy cheese, but a terrine or meat jelly often made with flesh from the head of a calf or pig. Question: 老師，可以藉機請問 lardo soldiers 怎麼翻譯嗎？很久以前我做試譯時遇到這道菜的名稱，一直不知道怎麼翻才好。雖然是義大利菜，但英文好像也都直接說 lardo soldiers. A soldier is a thin strip of toast. Lardo soldiers are thin strips of toast wrapped in lardo. For culturally specific terms, it’s now a common practice to coin a new term based on the pronunciation of the source text.